Kurt Wegleitner, Managing Director for ADDCON, talks to us about their product FORMI® Alpha, during Eurotier 2016, in Hannover, Germany. FORMI Alpha is a combination of 2 patented performance enhancers for pig and poultry production, which work in synergy due to their different modes of action. The effects of the plant extracts (alkaloids) are further enhanced by the patented FORMI technology. 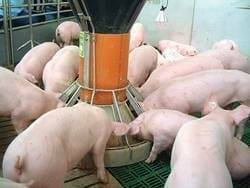 Hygiene and efficiency for the animals as well as optimal safety in producing meat are key requirements for modern animal production.